Saska Mitrova Jordanova graduated at the Faculty of Fine Arts at the University of “St. Cyril and Metodious” Skopje, Macedonija. Currently she paints and resides in Ljubljana, Slovenia. The real creative is not limited and never stop experimenting. Thus, in Saška’s images we find different designs and artistic styles – from portraits and landscapes to imaginative abstraction. All works have a personal touch and a dark quality. Most of the images show a magical world where there is a junction between fantastic and realistic images. Realistic portrait and some of the faces and figures are what we as viewers read the first from picture, on the other hand have a fantastic image, the viewer leaves the open and sometimes very personal interpretation. Featured motives often resemble scenes of nightmares, a popular starting point for creating a romantic painting. Present are the crowd dissolving the bodies that move into a disembodied and resemble ghosts or even discarded souls. Saška has developed its own unique dark style, even though the viewer at first sight frightened, not depressive, but intrigued and pulled into the magical world of uncertainty, which may not be pleasant, but we find it somehow familiar. Because it does not differ much from the outside world, which we call reality – both of which are often fraught with uncertainty and human fears. 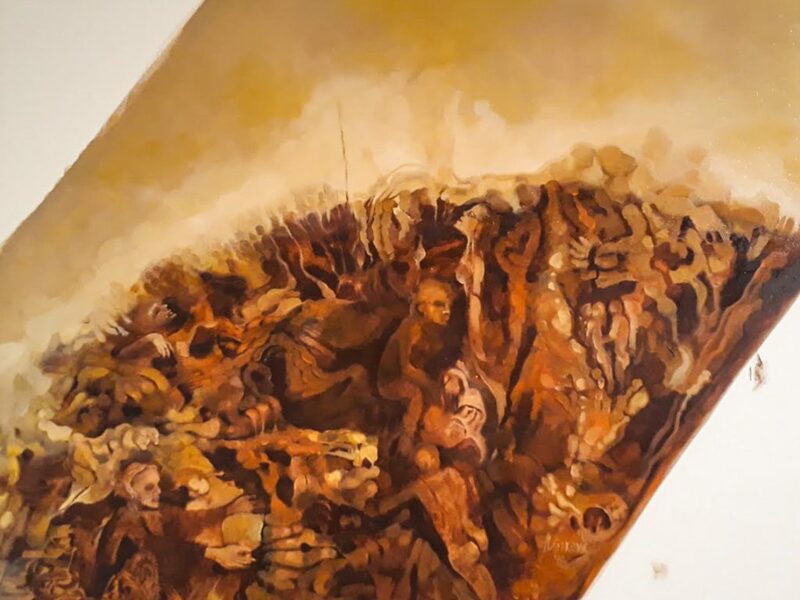 The difference is that Saška’s apocalyptic world is a much more honest, because negative feelings do not push and do not hide but be served thereby liberating. 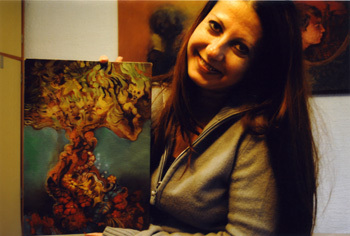 She has exhibited in Makedonia, Bugaria and Slovenia.